Is CCS concerned about in utero exposures to carcinogens and hormone disruptors, given the growing body of evidence linking cancer incidence in children, youth and adults to toxins in the womb? CCS has taken a stand against pesticides for ‘ornamental’ use – on flower gardens and lawns – but why not agricultural pesticides? Most of us do consume fresh produce and other food crops doused with chemicals (made primarily from toxic fossil fuels). In the big picture, our addiction to petroleum must soon end anyway, so why doesn’t CCS tout fresh, organic, whole foods now? Europe is way ahead of us in this department. When will CCS stop offering cars as prizes in its campaigns to help Canadians quit smoking? (One waggish Toronto group challenged Canada’s largest charitable organization this way: “We’ll stop smoking if you stop smogging.”) The latest glitzy Cars & Cash promo landed in our mailbox in mid-October – crazy-making. 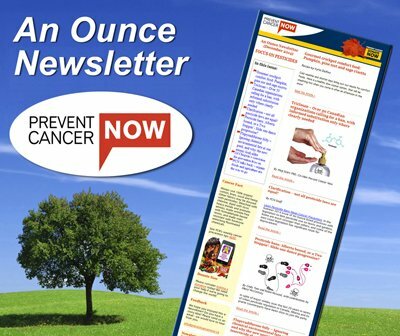 We have congratulated CCS in past issues of An Ounce for some great leaps forward on the cancer prevention front. But the statement we received from CCS in late July mostly summarizes what is already on its website, and is definitely thin soup in the face of our current cancer epidemic. PCN is concerned with the continuing focus on individual responsibility, rather than the bigger picture. While we are pleased to see a specific Cancer Prevention Research Initiative, CCS’s $3 million investment over the next three years seems paltry compared to the almost $50 million it spends on research each year. CCS also speaks of “close to $2.9 million this year alone for a broad spectrum of excellent prevention-focused research across the country that ranges from clinical trials to behavioural research to molecular and genetic studies.” At least some of those funds are directed to screening and individual behaviours, not primary prevention of the environmental and occupational links to cancer that are begging for funding and more focused attention. Given all we know about primary prevention, we expect Canada’s major national cancer organization to take a stronger stand.